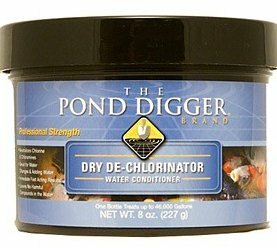 The Pond Digger Dry De-Chlorinator not only neutralizes harmful chlorine and chloramine levels in your pond, but also protects pond inhabitants from harmful and insoluble elements common in tap water. Better yet, it contains naturally soothing botanical extracts to help fish adjust in times of increased stress (which otherwise can increase risk of fish disease) while also creating a water environment safe for fish, turtles, tadpoles and aquatic plants. Using Helix Brand De-Chlorinator will render your municipal tap water safe to your fish and will protect them from chlorine exposure and heavy metal toxicity, whether in a brand new or long-established pond. Keep on hand, as the ability to make your tap water safe is indispensable in case of routine or emergency water changes or transit. Since this product is intended only to remove harmful elements from water, ensure that there is adequate biological filtration and/or remember to follow application with a beneficial bacteria treatment, in order to provide optimal nutrient absorption. If you have any questions about this product by Helix Life Support, contact us by completing and submitting the form below. If you are looking for a specif part number, please include it with your message.